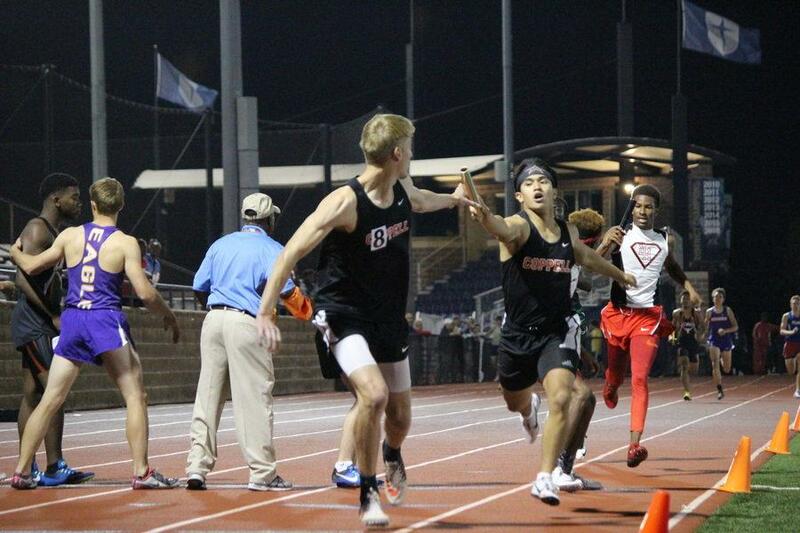 Coppell High School senior Matt Dorrity passes the baton to senior Zach Dicken in the Men’s 4x400 Relay Finals of the UIL District 9-6A Track & Field Championships hosted by Jesuit Dallas at Postell Stadium on Tuesday night. 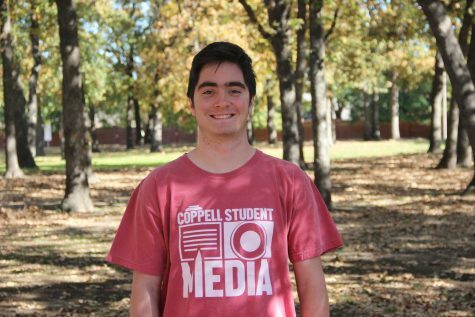 The Coppell team consisted of sophomore Christian Leffingwell, junior Gabriel Lemons, senior Matthew Dorrity and Dicken. The team placed second in the event, after Dallas Skyline, with a time of 3:24.37. 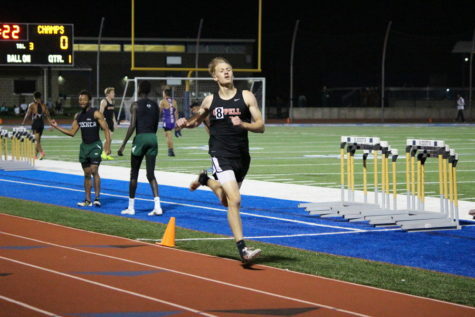 DALLAS – Coming around the final turn of the boys 4×200 relay, Coppell senior Josh Freeman could feel the Skyline athlete coming up right on his heels. Arms pumping, baton in hand, Freeman gave the final stretch of the race every ounce of energy he had, winning by .05 seconds. 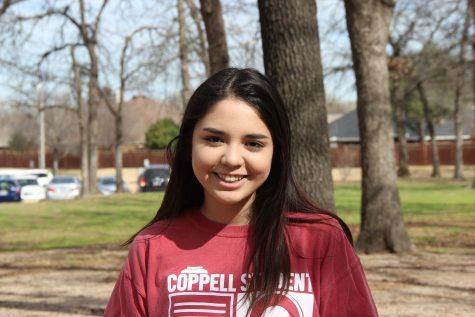 This win, one of 12 first place finishes by a Coppell athlete or relay team, helped lead both the boys and girls track team to place first in the District 9-6A Meet at Jesuit College Preparatory School of Dallas on Tuesday. Freeman’s finish is just one of the number of points that the team picked up on the track. With the clean sweep of the meet, Coppell placed in the top six in every varsity event, and placed in the top four in all but one. Coppell picked up numerous points in the field events, including taking the top three spots in girls shot put and girls pole vault. The girls racked up 112 points in the field events alone, while the boys added 45 to their points total. Junior Rachel Okereke again led the girls squad, winning District 9-6A in the high jump and placing third in long jump. Freshman Lauren Kellet also had an outstanding meet, as she placed first in both triple jump and long jump. In all, the boys and girls team had 19 different qualifiers for the area meet in the field events had the teams not placed in the top four. On the track is where the boys side was able to take control of its lead. Senior Zach Dicken finished in the top three in the 200 and 400 and was a member of the 4×400 relay that placed second. Of the six boys and girls relays, Coppell placed in the top four in each one. Up next for the District 9-6A champions is the area meet in Garland on the weekend of April 21, where the 9-6A winners will take on athletes from the Garland ISD high schools.